April showers (I hope) lead to May flowers, and this floral Mother's Day brunch gives us all the feels for spring's arrival! If you haven't marked your calendars, Mother's Day is just a few weeks away on Sunday, May 13. So whether you’re planning for Mom or you are mom (or both! ), scroll for tablescape tips and recipes to make this Mother’s Day your best — and most relaxed — ever. My friends at Bella Vita helped me curate the embodiment of the season and feminine romance in a dish design: The Casafina Ibiza and Majorca lines. The Ibiza salad plate's speckles of lilac and coral inspired our floral arrangement, which includes peach garden roses, peonies and varieties of bohemian greenery. The flower petal's shapes and waves effortlessly carried into the Majorca dinner plate and pasta bowl duo. Raw linen natural placemats, which I oped to use as napkins for this gatherings (it's simply a matter of the fold, right?! ), created a neutral base for the Casafina Ibiza and Majorca dishware. I tucked each beneath the plate, draping off the edge of Mom's dining room table. Since we typically like to arrive at my parents' a bit prior to our meal to share cards and gifts, I advise setting out a stack of Casafina Ibiza coffee mugs for Sunday morning caffeine. Additionally, morning mimosas tie into the toast-worthiness feel of the affair as well as the color palette. 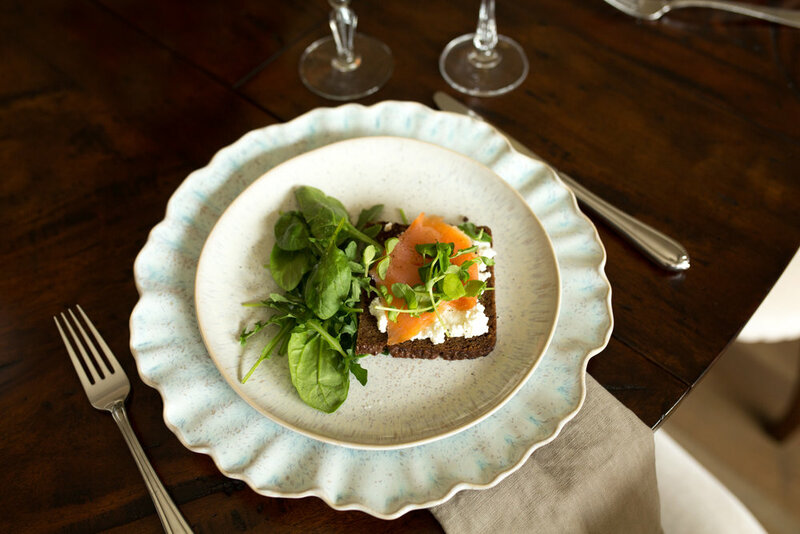 For our Mother's Day menu, I first created a tray of smoked salmon and whipped cream cheese tartines on rye. The color contrast of the dark toast and light plates is striking, especially when balanced with the perfectly-hued peach centerpiece. I added a simple garnish of organic pea shoots and cracked black pepper. If you prefer a more mild cheese, whipped ricotta is equally delicious! 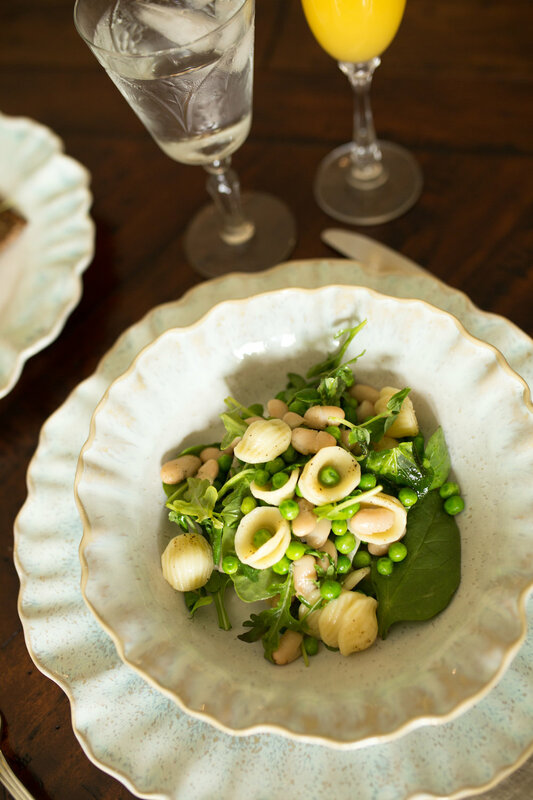 Additionally our orecciette pasta salad, served among bowls via the Ibiza salad serving set, carries a low-carb secret—the ratio of pasta to cannellini beans is 1:2, allowing protein and greens to take center stage (and relinquish half the guilt). Simply boil 1/2 pound of orrechiette pasta shells in salted water until al dente and set aside. Then, in a large pot, heat 2 cans of drained/rinsed cannellini beans over medium-low in 2 tablespoons olive oil with sea salt and red pepper flakes. Add frozen peans and carefully stir until thawed. Pour in pasta and tender greens (I prefer a baby kale and baby arugula combo), drizzle with truffle oil and a generous pinch of sea salt. Stir, remove from heat, and serve warm or at room temperature. This post is brought to you by Bella Vita. Thank you for being supportive of our sponsors!